Alcoholism and Diabetes: Does Alcohol Lower Blood Sugar? According to the National Diabetes Statistics Report of 2014, 29 million people in the U.S. (9.3 percent of the population) have diabetes. About 86 million adults have pre-diabetes, a condition that significantly increases their risks of eventually developing the full-blown version of the disorder. According to the American Diabetes Association, most people with diabetes can drink a moderate amount of alcohol if their blood sugar level is well under control. The key here is moderation. A moderate amount of alcohol is known to be beneficial for the heart and can reduce the risk of heart disease. However, before drinking you should always consult your doctor to find out if alcohol is safe for you. When your drinking, or the drinking of a loved one gets out of control, the impact on your health can be enormous. At this point treatment is the only answer and your best chance of finding lasting sobriety. Call (888)-459-5511 for more information about your options for recovery. Diabetes is a lifelong condition where either the body (the pancreas) does not produce enough insulin or the insulin does not work as expected. Insulin is a hormone that facilitates the conversion of glucose (sugar) in the bloodstream to cellular energy, which then fuels a wide range of biological activities. Because of lagging insulin levels, diabetics have an excess of glucose in the bloodstream. Over time excessive blood glucose levels can damage major organs throughout the body, including the eyes, heart, and kidneys. Unmanaged diabetes can increase the risk of cardiovascular disease, stroke, nerve damage, blindness and kidney failure. Type 1 diabetes develops when the pancreas either cannot produce insulin or produces too little to be effective. Formerly known as juvenile diabetes, Type 1 diabetes typically develops in late childhood or adolescence; it can be genetic, or develop after a bout of viral infection or due to an autoimmune disease. 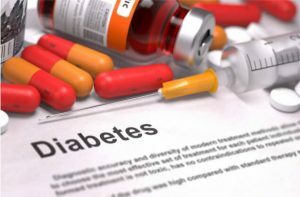 It generally produces more serious symptoms than other types of diabetes, and those who suffer from Type 2 diabetes will need insulin therapy to manage their conditions. Type 2 diabetes is the most common form of the disorder. It develops when either the pancreas does not produce adequate insulin or the body cannot properly utilize the insulin that is being released. Genetic influences make some people more vulnerable to Type 2 diabetes, but lifestyle factors such as obesity, poor nutrition and a lack of physical exercise are what usually trigger its onset. Through lifestyle modifications, the symptoms of Type 2 diabetes can often (but not always) be managed without insulin therapy. Gestational diabetes only occurs in pregnant women, and will only be diagnosed if they’ve never suffered from diabetes before. Gestational diabetes causes glucose levels to rise during the the time a fetus is in the womb, and if left untreated can cause the unborn child to develop health complications immediately or later in life. Type 2 diabetes does not develop overnight. A person is usually in a pre-diabetic stage—when his or her glucose levels are higher than normal but not as high as that of a diabetic—for some time before he or she develops type 2 diabetes. As many as 86 million Americans suffer from prediabetes. They are at a greater risk of developing Type 2 diabetes than people whose blood sugar levels are within the normal range. The problematic relationship between type 2 diabetes and alcohol abuse is undeniable, and type 1 diabetes and alcohol do not always mix well, either. Alcoholism can exacerbate the symptoms of diabetes if the disorder is already present, and alcohol-induced diabetes (type 2) can develop in those who carry a predisposition for the condition if the alcoholism is not treated promptly. Decreasing insulin sensitivity. Alcohol abuse can lower the body’s ability to use insulin, inhibiting its capacity to regular blood sugar levels. Causing the onset of pancreatitis: Heavy drinking can cause chronic pancreatitis (severe and enduring inflammation of the pancreas), damaging that organ’s ability to produce adequate supplies of insulin. Runaway blood sugar levels—and type 2 diabetes—are one possible consequence of pancreatitis. Adding to body weight and contributing to obesity: Obesity is the primary cause of type 2 diabetes, and alcohol contributes to obesity because it contains lots of calories in the form of carbohydrates (sugars). Additionally, over time constant alcohol consumption can create powerful sugar cravings, and that is why so many alcoholics overindulge in desserts and fill their diet with empty (and excessive) calories. Alcoholism also contributes to a lack of exercise and physical activity in general, since men and women with drinking problems frequently suffer from low energy, low motivation and depression. Each of these factors helps explain why alcoholics are prone to obesity, and why type 2 diabetes and alcohol are often closely related. Alcoholic drinks like beer, sweet wine, cordials or mixed drinks are loaded with carbohydrates that can cause blood sugar levels to soar. Alcoholic drinks are typically dense in calorie content. Alcoholic beverages contribute to weight gain that, in turn, hampers blood sugar control. Alcohol stimulates the appetite, and overeating can cause a spike in blood sugar levels. In the immediate term, alcohol consumption can cause a drop in blood sugar levels. Excessive alcohol consumption clouds the senses. This can make a diabetic person choose foods they should avoid. Poor food choices can, in turn, raise or lower blood sugar levels. Alcohol may inhibit the workings of oral diabetic medications and/or insulin shots. The effect of alcohol on blood sugar is profound, both in the short-term and long-term. Hypoglycemia is a condition that causes a diabetic person’s blood sugar levels to periodically plummet. Also known as insulin reaction, it is marked by shakiness, nervousness, uncontrolled sweating, dizziness, drowsiness and confusion. If not treated promptly with glucose, low blood sugar can lead to fainting, or in some instances it can cause a sufferer to slip into a diabetic coma. 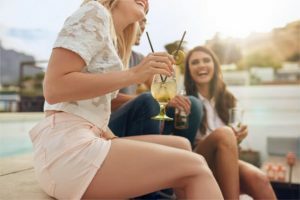 Binge drinking can also cause blood sugar levels to drop, and that makes such behavior extraordinarily dangerous for anyone subject to hypoglycemic reactions. Another problem is that symptoms of low blood sugar level may can be confused with the side effects of drunkenness, making such a condition easy to overlook in alcoholics. The American Diabetes Association lists hypertension as a common comorbid condition of diabetes. Alcohol consumption is also known to raise blood pressure levels, and this is yet another negative effect of alcohol on diabetes. Chronic high blood pressure puts pressure on the heart, damages the blood vessels and increases the risk of heart disease, stroke and kidney failure. Boosted levels of triglycerides, a type of fat found in the blood that is only safe for the heart in moderate doses. Diabetic neuropathy is a neurological condition that afflicts many long-term diabetics. They often experience pain, numbness and burning and tingling sensations that may be worsened by alcohol consumption. Alcohol abuse is known to cause nerve damage even in people without diabetes, but when alcoholism and diabetes co-occur the results can be disastrous. Diabetic neuropathy will respond partially to treatment, but it is a condition that can never be completely cured. Many studies have proven that a moderate amount of alcohol is beneficial for the heart and reduces the risk of developing heart disease. Now, additional studies have shown that people with diabetes can benefit from drinking in moderate quantities, provided their blood sugar levels are under control and they don’t have other conditions (like high blood pressure) that may be exacerbated by drinking alcohol. According to a study carried out by the Harvard School of Public Health, women with type 2 diabetes who drink moderately have a lower risk of developing heart disease than non-drinking women with the same condition. Meanwhile, diabetic men who drink moderately also have a reduced risk of developing heart disease, which matches the experience of non-diabetic men who consume small amounts of alcohol. However, there is NO added benefit for the heart if a person drinks compulsively or to the point of intoxication. On the contrary, excessive drinking damages the heart and is far worse for overall health than complete abstinence. Also, it is important to note that drinking alcohol will not reduce the risk of developing heart disease if other heart-healthy practices are not embraced. Moderate alcohol consumption is acceptable for diabetics and others if it is partnered with regular exercise, a high-quality diet low in harmful fats, no smoking and the maintenance of an ideal body weight. If you want to reap the benefits of moderate alcohol consumption, please ask your doctor first about how much you can safely drink if you’ve been diagnosed with type 1 or type 2 diabetes. When it comes to diabetes and alcohol, the only choices are safe drinking or no drinking at all. If you’re a diabetic or a pre-diabetic who enjoys the occasional beer or glass of wine, it is absolutely essential that you practice safe drinking habits all the time. The safe limit for drinking for men with diabetes is no more than two drinks a day. The safe limit for drinking for women with diabetes is no more than one drink per day. Stay informed and never drink unless you’re sure of exactly what you’re consuming. Heavy craft beers may contain twice the amount of alcohol as a light beer, while a screwdriver (vodka and orange juice) would contain more calories and carbohydrates than an equivalent amount of white wine. As a diabetic, you cannot afford to ignore such distinctions. Don’t drink on an empty stomach. Food decelerates the absorption of alcohol into the bloodstream and prevents sharp drops in blood sugar levels in the process. Make it a habit to read the labels on alcoholic drinks. The abbreviation ABV stands for ‘Alcohol by Volume’ and indicates the percentage of a beverage that is pure alcohol. Condition yourself to choose drinks that contain reduced amounts of alcohol, carbohydrates and calories, like light beer or dry wine. Mix alcohol with water or low-calorie diet sodas instead of sugary mixers, to restrict the carbohydrates and calories you consume. At social gatherings, after you’ve had a drink (or two) switch to a non-alcoholic beverage if you feel awkward about not drinking. Stick to your meal plans or calorie restrictions when you drink. If you fear that alcohol might cloud your senses or weaken your resolve, ask a friend or a family member to help you stay focused. Wear your diabetes medical alert jewelry at all times. This ensures people and/or paramedics won’t mistake signs of hypoglycemia for drunkenness. Don’t break your routine. 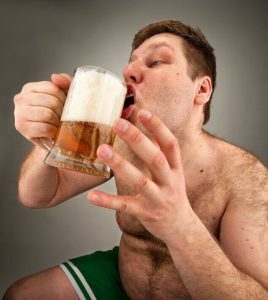 If you give yourself permission to surpass your drinking limit once, you’ll soon find yourself doing it again and again. These tips only apply to those who do not have a drinking problem. Alcoholics cannot control their drinking or its disastrous impact on their lives, and if you suffer from alcohol addiction, there is no level of drinking you should consider safe, whether you have diabetes or not. Martha has been suffering from type 2 diabetes for over a decade now. But she has not given up drinking; she loves her sherry and gin too much to become a teetotaler. To stay out of danger, she carefully monitors her blood sugar and drinks no more than one alcoholic beverage per day. There are NO sugary mixers or fried and sugar-laden foods in her home. With all sources of temptation removed, she doesn’t have to fret about temporary weakness. Before heading out for a party, she loads her phone with alerts that beep at regular intervals throughout the evening and remind her not to drink more than one serving or eat too many calorie-rich foods. Whether you have type I or type II diabetes, your challenge is to keep your blood sugar levels in check and not create conditions that trigger attacks of diabetic symptoms. If you have prediabetes, you must keep your body weight under control and avoid any activities that might make your body less sensitive to insulin, or prevent you from producing it in sufficient quantities. If you have diabetes and are not an alcoholic, drinking limited amounts of alcohol can remain an option if you are prepared to embrace a lifestyle that promotes and preserves wellness. But alcoholism and diabetes are a potentially lethal combination, and if you’re alcoholic and suffer from diabetes the only way to ensure your safety is to quit drinking and seek treatment for your alcoholism immediately. Alcoholism can be an aggravating factor for diabetes and other serious health conditions. If you are struggling to overcome the negative effects of alcohol addiction, call (888)-459-5511 right away to find out more about available programs for recovery.